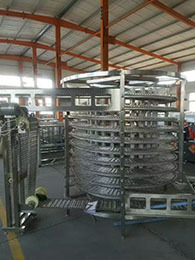 Spiral Quick Freeze Machine is suitable for frozen potato chips fries, banana/plantain chips vegetable chips manufacture. Low installation space request, highly freezing efficiency and energy-saving are the most features. Nominal capacity is 300kg/h ~ 6000kg/h. compact structure and large capacity are its advantages. Spiral Quick Freeze Machine is suitable for frozen potato chips fries, banana/plantain chips, vegetable chips manufacture. 2. Higher tensile strength SS mesh ensure a long services time. 3. Three chain structure to increase the effective freezing surface and fundamentally solve the problem of freezing material turning over from mesh belt. 1. The cold storage panels are consisted by an inner and an outer SS plate, and an intermediate Rigid Poly-ether Polyurethane Foams insulation layer which the density is 42Kg/m3. 2. Convex groove installation and eccentric hook connection design make idea heat preservation efficiency. 3. There is an inspection door in the refrigerator library body which has the electric heating device working under low voltage to keep off freeze. 4. There is maintenance passage in the refrigerator library for inspection and maintenance easily. 1. The horizontal circulation air supply system makes an air distribution smooth and uniform air field. 2. Proper air follow and pressure improves freezing efficiency and energy saving. 1. Full aluminium evaporator with stainless steel shell meets the food hygienic requirements. 2. Faster defrosting and longer interval defrosting time due to the fin pitch change structure design. 3. 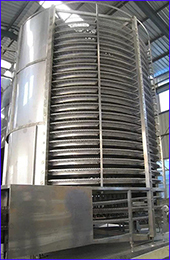 Big size tube radiator of evaporator improves the heat transfer efficiency and Internal clean easily. 1. Axial flow fan has Ram stainless steel, aluminium alloy blades with zinc coating motor shell. 2. Enclosed moisture proof low temperature motor works smoothly with low noise. 1. Both inside and outside framework are all made from food grade SS material. 2. The material touched the transfer mesh is wear-resistant ultrahigh molecular polyethylene has longer service time and in accordance with the food safety and hygiene standards. 1. Overall welding stainless steel water pans ensures never leak. 2. Smooth drainage due to a large slope design. 1. Mesh belt running speed adjustable adopts Fuji inverter. 3. SS control panel is supplied.